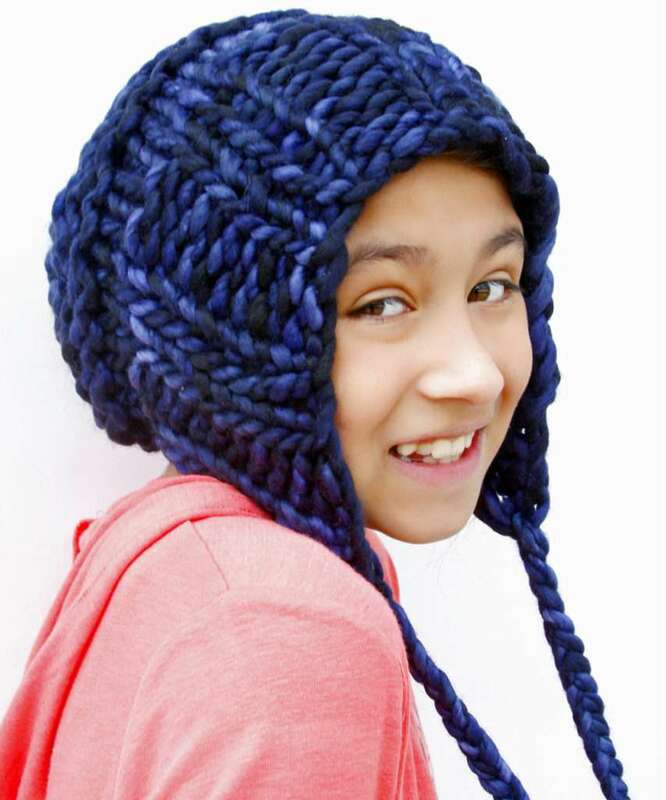 A playful winter hat with tassels to top off the fun! Worked in less than 1 hour with the new Zippy looms and the Zippy Corners. Knitting Loom: (6) Zippy looms, and Corners. Yarn: 80 yards of super bulky weight yarn. Malabrigo Rasta in Paris was used in sample. Cast on 28 sts, prepare to work a flat panel. Row 1-Row 10: Sl1, K2, p2, *k2, p2; rep from * to last 3 sts, k3. From this point forward, work in the round. Round 1-2: k to the end of rnd. Rnd 3, 5, 7: k: k to the end of rnd. Rnd 4, 6, 8: p to the end of rnd. Rnd 9-12: k to the end of rnd. Rnd 13, 15: k to the end of rnd. Rnd 14, 16: p to the end of rnd. 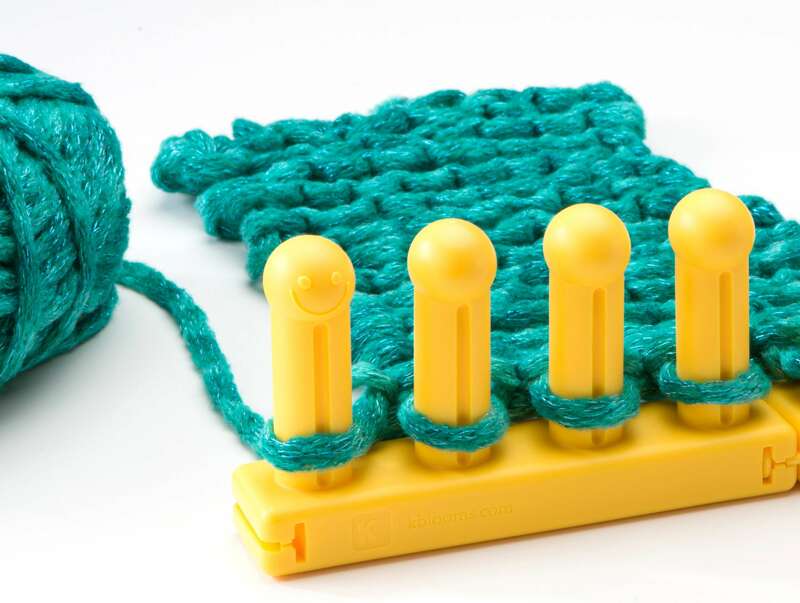 Remove the stitches off the knitting loom onto a piece of scrap yarn. Remove 2 of the Zippy looms and assemble down to 20 pegs using 4 Zippys and the Corners. *On peg 1: place 1 loop. On peg 2: place 2 loops. On peg 3: place 2 loops. On peg 4: place 1 loop. On peg 5: place 1 loop. Rep from * all the way around the knitting loom. Rnd 17: k to the end of rnd (20 sts). Rnd 18: p to the end of rnd. 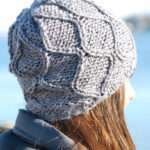 Bind off with gather removal method. Weave ends in. Block lightly. Tassels: Cut 6 pieces of yarn that are about 40 inches in length each. Grab three of them, and fold them in half. 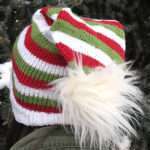 Pass them through the corner stitch at the edge of the hat, so that there is approximately, 20 inches of yarn on each side. Divide them into 3 groups of 2, then braid them. Make a knot at the end of the braid and clip the yarn. Repeat on the other side.